For the past 20 years, Brazil and Mexico have been the main focus markets for multinational investments in LATAM. However, when it comes to opportunities in e-commerce, Chile is hot, hot, hot! Latin America’s fortunes have waxed and waned over the past few years, and economic uncertainty continues to be a challenge in the region. Yet, when it comes to e-commerce, the prospects are far rosier. Latin America has some 620 million people and an Internet penetration of 61%. Smartphone usage is also exceptionally high, digital connectivity is improving across the region, incomes are rising and consumers are becoming more and more comfortable shopping online, which has led to a rapid growth in online activity. And the journey has only just begun! Euromonitor projects a compound annual growth rate of 21% for Latin American e-commerce through 2020 and a total of $54 billion in sales by the end of that year. When it comes to focusing investment in e-commerce, given Latin America’s diversity, it makes sense to ask: “Where is the economic sun shining most brightly?” According to the EIU’s Business Environment Rankings, the best bet in the region is Chile, which has maintained stability over the years. The rankings, which compare the attractiveness of doing business in 81 different countries, gave Chile 7.8 out of 10 – the highest of any score in Latin America. Mexico scored 7 and Brazil received a 6.3. 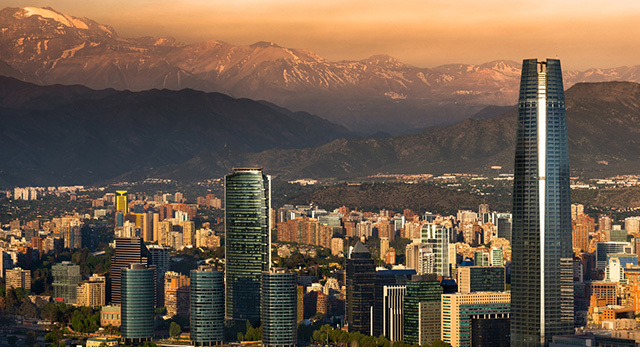 So what makes Chile so attractive for e-commerce? Aside from its pro-business stance, regulatory and legal transparency and high investor confidence, over the last few years poverty levels have been reduced from 38% to 8% of the population. Its GDP per capita has soared from $5,800 to $23,000. With the population at just 17.6 million, more than 40% of inhabitants are aged between 15 and 39. The increasingly young, and affluent, middle class is quickly gaining an interest in international brands, which is reflected in the increase in spending on personal goods as well as demand for credit and finance. Chile now has the most credit cards per person in the whole of LATAM. Finally, at 72.3%, Chile boasts the highest level of Internet penetration in the whole of LATAM, which explains why e-commerce is gaining such good traction here. When it comes to delivery and fulfillment in Chile, however, there is plenty of room for improvement. E-commerce delivery services in Chile need the tools to ensure speed, tracking, flexibility, a reliable next-day service and simple returns. There’s a gap in the market for good fulfillment and delivery, which is why in March we launched our new B2C domestic delivery service focused on providing a great service and a fantastic customer experience. DHL eCommerce Chile is our first location in South America to provide domestic final mile B2C delivery. DHL eCommerce not only provides domestic parcel pick-up and delivery, it also offers extended delivery times and reverse logistics, including returns. Things are heating up for e-commerce in Chile! We plan to make e-commerce synonymous with great service and will “deliver the smile in the last mile”!